Shopping in Venice can be overwhelming. There is such an abundance of choices and many are knock-offs and tourist traps that import mass-produced items. Where can the discerning traveler pick up a truly Venetian souvenir? Here our guide to some one-of-a-kind shops you won’t be able to find anywhere else. This little family shop near the Bridge of Sighs is curated with care. The story of the shop begins with Mario coming to Venice in the 70s to sell his paintings on the streets. The watercolors are truly original, capturing the essence of a timeless city suspended in water. His son, Lorenzo, is a photographer and his works show a completely different side of Venice. You’ll see a city of the past in a startlingly contemporary way. Moulaye trained with the glass masters of Murano Island and he creates astounding glass beads influenced by the bold patterns of African art. If you stop by when he’s there, you might ask him for a demonstration. You’ll get to watch as he combines colors on the heat of the burner to draw out beads that are like wearable works of art. He never makes the same bead twice, so every piece is literally unique. Paolo Olbi has been making hand-bound books for decades and his craftsmanship is impeccable. His studio is right in the back of the shop and everything is made right on the premises. Pick up something spectacular to inspire your next journal, sketchbook, or scrapbook. Stefan is a Bulgarian artist who works in traditional techniques of printmaking and painting. Stop by his studio and you might catch him heating rabbit glue to prepare canvases, or spreading sticky tar onto metal plates, or running prints through the huge metal press in the middle of the room. You can buy any of his work, but an even more memorable souvenir would be to ask him for a portrait. 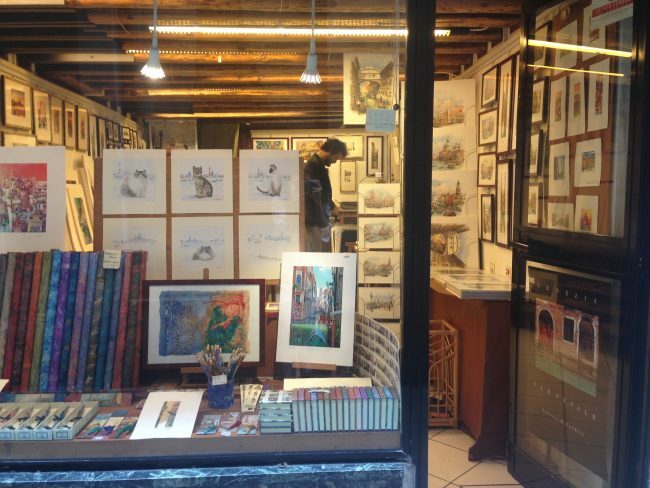 Whether it’s in pencil or paint, he’ll capture something of you that you’ll get to take home as a keepsake of your trip to Venice. Entering this shop is like stepping into another world: the decadent world of the Carnival. In its historic form, this was a festival wherein social roles like male and female, or upper class and lower class were all upended for a few glorious weeks of sinful and extravagant pleasures. You could be who you wanted to be during the Carnival and here in this shop, you’ll get to pick up your very own little piece of that sumptuous past. This place is also a true artisan boutique, as the masks are all made and painted by hand. You can also take a course in mask-making with the artists themselves. This clothing shop is part of the association Rio Terà dei Pensieri, which employs those serving prison sentences. You’ll find 50s style cocktail dresses, elegant handbags and colorful winter coats, all impeccably tailored and made of sumptuous materials. Everything is handmade by the women at the female prison in Giudecca.